Our Lady of the Rosary - Marian Retreat Joyful Mysteries The Visitation by Fr. John A. Hardon, S.J. Our present conference is on the second Joyful Mystery, the Visitation of Our Lady. This mystery is really two mysteries in one. First the Visitation itself and then the Magnificat which Mary said - or as we may believe - sang on the first day she visited Elizabeth. Our conference plans to cover both mysteries and in both cases simultaneously as we go along, first the Visitation and then theMagnificat, reflect on the meaning and apply the mystery to our lives. Charity Has Eyes to See People’s NeedsFirst then, the Visitation. St. Luke devotes six verses to the actual Visitation before he narrates what Mary surely told him - the Magnificat. Then there’s one verse covering the Visitation after Mary’s Magnificat. In sequence: Mary on hearing from the Angel that Elizabeth was in her sixth month went immediately and she went with haste - on several occasions. This is the first one. St. Luke has people running. And she left one part of Palestine namely, Galilee, to another part, Judah, commonly now identified as Ain-Karin not far from Jerusalem. We should remind ourselves that Mary was not told to visit Elizabeth. Charity does not have to be told what to do. Charity has eyes to see people’s needs. She hurried - one translator says she ran as fast as she could. I think the Greek allows us to say that. Evidently she was still very young. An Unborn Child Is a Human BeingMary entered Zechariah’s house. In the meantime remember, Zechariah had become speechless. 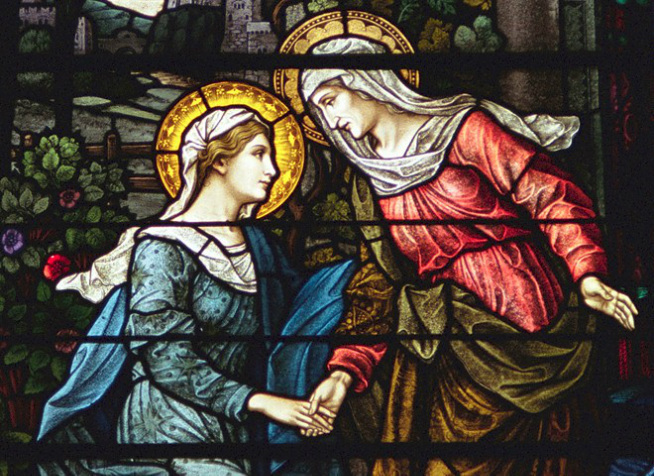 Mary greeted Elizabeth. We’re now told what words she used in greeting her kinswoman. Immediately on hearing Mary’s voice, the unborn child, John, leaped in his mother’s womb. John’s being able to recognize who Jesus really was came evidently from infused Knowledge while still unborn and Christ still unborn. Faith does not have to have eyes of flesh to see. Immediately on hearing Mary’s voice the unborn child, as we said, leaped. In another words, an unborn child is a human being! An unborn child - how many mothers in either bearing a child or having brought children in the world have told me - the unborn child is affected by the mother’s state of body and state of soul. Here Elizabeth’s joy affected John. I’ve told married women, you begin to instruct your child the moment that baby is conceived in your womb. Mary’s Voice Brings the Holy SpiritFourth reflection in the Visitation. Elizabeth’s reaction was, as Luke tells us, to be filled with the Holy Spirit. She was filled with the Holy Spirit. Why? Because the moment she heard Mary’s voice - Mary’s voice brings the Holy Spirit - and the unborn child in Mary’s womb began His work of Redemption before He was born. It is the humanity of the Son of God that is THE – capital “T”, capital “H”, capital “E” – it is THE humanity of Christ which is the channel of all the graces for the human family. Mary Is the Mediatrix of GracesBut of course Elizabeth having been enlightened on Whom Mary was carrying - she had to believe! In a few moments Elizabeth will compliment Mary for believing. Elizabeth believed too! Faith is the foundation for all the graces we expect to receive from God. Christ then, began to give His graces through His Mother Mary. This we’re told by the Church is the first proof that Mary is the Mediatrix of graces. And judging by the amount and frequency and depth that Our Holy Father is using in talking about the mediation of Mary I expect, maybe not in this Pope’s lifetime but not too far away, there will be another definition besides the Immaculate Conception and the Assumption; Mary’s Mediation of Grace. As we’ve been saying and will keep repeating throughout the retreat - Grace comes from Christ who is God through His Mother Mary to us. The Church commonly holds that John was delivered from sin in his mother’s womb. Unlike Mary, who was conceived without sin, John the Baptist was born without sin. And the means of removing that sin was the Presence of the humanity of Christ. And we have to add, through the voice of Mary. John Was Sanctified by Christ through the Words of MaryElizabeth was thus filled with the Holy Spirit and it had several consequences. The first we’ve just said: John the Baptist leaped in his mother’s womb. But the second: Elizabeth made a profession of faith. She was the moment Mary spoke, enlightened in her mind. That’s what faith is. Faith provides light for the mind to see what human reason could never see except for the grace of God. What did Elizabeth learn? She learned who Mary was and she learned who Jesus was. And her enlightenment (this is Mary’s) came because Christ came close to Elizabeth and Mary spoke. As a consequence of Mary’s words, Elizabeth was enlightened. Notice the second dramatic effect. First effect: John was sanctified. Sin was removed. By Whom? By Christ. How? Through the words of Mary. First effect. But secondly John’s mother, Elizabeth, was enlightened in mind. That is the second marvelous effect of Christ’s Presence and Mary’s voice. What was the effect? Elizabeth learned. She received the grace in her mind to see, though Christ was still unborn, to recognize who Jesus was and to fathom who Mary was. Jesus Is the Incarnate GodNumber six. Elizabeth then proceeded to tell Mary first, “Blessed are thou among women”; what you have been reciting as Christians for two thousand years. Moreover, Elizabeth told Mary that not only she, Mary, was Blessed among women; but the fruit of her womb, Jesus, was also Blessed. The expression “fruit of your womb” as I’m sure you know in Latin the verb for to enjoy is fruiand the joyful product of your womb, Jesus. Elizabeth then goes on speaking, rhetorically asked herself, “How have I deserved, deserved that the Mother of my Lord should come to me?” Anytime anyone dares to even intimate, even suggest that either Mary did not know Whom she had conceived, that she did not know that the Child she conceived was the Son of the Living God - anyone who doubts that Mary knew that, anyone who doubts that Elizabeth knew that, and worse still, anyone who doubts that Jesus, from the first moment of His Conception knew who He was; Anyone who claims that either Mary or Elizabeth or Jesus did not know that the Child that Mary conceived at Nazareth is the Living God in human form - and that Christ had that knowledge, Mary and Elizabeth had that knowledge from the first moment of the Annunciation - that person (and I mark my words carefully) is a demonic liar, even though that writer has an Imprimatur and has degrees dripping off the page after his name. I repeat: Anyone who doubts that Jesus or Mary or Elizabeth did not know that the Child that Mary conceived and brought with her to Elizabeth; that they did not know that already that unborn Child was the Living God: Anyone who claims that, is not I repeat, telling the truth. Watch your reading. Mark the language that people use. The least shadow of doubt as to whether either Christ Himself or His Mother knew that Jesus is the Incarnate God is not, I repeat, is not a believing Catholic. Mary Is the Mother of GodElizabeth therefore exclaimed, “How did I ever deserve that the Mother of my Lord, the Mother of my God should visit me?” All the prerogatives of Mary, all the qualities, all the titles by which we address her are finally founded on one truth of our faith that – Mary is the Mother of God. Anything and everything else we say about Our Lady has her Divine Maternity as its foundation. The Holy Eucharist Began in the Womb of MaryThen we’re told, because Elizabeth said so, that John the Baptist not only leaped in his mother’s womb but was filled with joy - was filled with joy. We could now start the retreat all over again and spend the next six days on what should be the greatest source of joy for us on earth: To have the Living God in human form in our midst. And whatever grace you pray for, I beg you to pray for the grace of experiencing joy in being near to Jesus now on earth. I’ve been telling my students both in Sacramental Theology and Christology, “The Holy Eucharist began in the womb of Mary,” the same identical, mathematically, historically, geographically, physically, bodily (pardon another adverb) metaphysically, same Jesus that Mary carried in her womb. Elizabeth did not see Jesus. Neither do we. Am I clear? We believe with the mind. We don’t believe with the eyes. Ah, but the mind has eyes of its own! And a good measure of the depth of our faith in God’s becoming Man and being among us in the Blessed Sacrament is the joy we experience. That’s an embarrassing barometer for our faith. Blessed - Made Happy by GodWe go on. Elizabeth then told Mary that she, “Mary, was Blessed”, that is made happy by God. Remember that. Whenever Sacred Scripture uses the word “blessed” someone being blessed, it always means made happy by God. And Elizabeth even tells Mary why she is Blessed. First, because Mary believed. God will make us as happy as our faith is strong. Been ordained forty-two years. In these years I’ve met, some for a short time, some I’ve known, well, for forty-two years; I’ve yet to meet a happy unbeliever. They don’t exist. One reason, I honestly believe, that the genius of modern science has invented so many (what shall we call them) time-saving devices, pleasure-giving devices is to provide some substitute to unbelievers for the lack of genuine happiness that comes only by God – conferred by Him and depending on our faith. Mary’s Faith was The Most Demanding PossibleBut Elizabeth gives another reason why Mary was Blessed, made happy by God: both because she believed, and because everything that God had promised her would be fulfilled. How this needs saying! There are two kinds of joy that God confers on us here in this valley of tears. The first is the joy given by our faith in the experience of doing God’s Will. That is present joy. But there is another joy which we are to experience already here in anticipation of the Beatitude that God still has in store for us. Take the season of Christmas. In Detroit I noticed they’re putting up Christmas wreaths and lights especially in the business district of the city from, and I can prove it, before Thanksgiving. Is there joy in anticipation? Is there? Mary, then, was made happy by God both because she believed and she saw what the eyes of her Body did not show her. She saw that the Child she was carrying was her God. But she also hoped. You see, there are three sources of joy; we’ve just touched on two now. We’ve got more days coming in the retreat. The first source of joy is faith. The second source of joy is hope. The third source of joy is charity. Mary’s faith was the most demanding possible. Yet she was happy because she had the faith. She saw beyond, beneath, below, the working of God, indeed, the Presence of God. God will try us that’s a safe statement. The secret is to know that God is behind it. I’m in pain. I don’t like the pain; nobody does. But would you believe it? I’m happy! Why? Because ah, but my faith must be clear! I see God behind that pain, in that pain. I’m not being poetic in saying this. There is profound - I would use the superlative - the profoundest joy on earth is the happiness that comes from enduring pain which my faith tells me is sent me by a Loving God. I wouldn’t have the gall to say this unless I believed it. Faithful People Are Hopeful PeopleMary’s faith was the foundation for her hope. We can look forward to all that God has promised us only in the measure of our faith. Faithful people are hopeful people. Faithless people are hopeless people. We are as hopeful as we are faithful. Mary knew she would be rewarded and she was happy over the anticipation of the reward that awaited her. One of the Great Mysteries of Our Catholic FaithThen, the sixth reference in Luke’s Gospel at the end of the Magnificat, Luke adds, and Mary stayed with Elizabeth for about three months; that is, we may believe until John was born. And then she went back home, Luke says, to Nazareth. The Visitation is one of the great mysteries of our Catholic faith; teaches us many things in all that we’ve said and much more than we could say. Just one more observation before we leave the Visitation and reflect on Mary’s Magnificat. Charity Is Always in a HurryThe Fathers of the Church emphasize Mary’s, listen, contemplative charity. So far from being incompatible - working, serving, helping others - so far from that be incompatible with contemplation. Charity is the logical fruit of contemplation. And the qualities of Mary’s charity (we could start all over again) have never been revealed more than in her rising and going in haste to help her kinswomen in need. Charity sees people’s needs. At a distance! Charity, St. Ambrose says, is always in a hurry. Because people’s needs can be immediate. But watch it! Like Our Lady, we will be only as charitable toward others, only as kind toward others, only as self-giving to others as we are near Christ and Christ is near us. In other words, the pre-condition for practicing charity toward other people is living in the Presence of God, believing He is within us always by His grace, and believing He is always near us in the Holy Eucharist. Now the Magnificat. MagnificatI counted them; there are ten verses to the Magnificat which is the first of three hymns surrounding the coming of Christ. Talk about celebration. First Mary’s hymn, the Magnificat. Then Zachary’s hymn, the Benedictus. Then the angel’s hymn, the Gloria in Excelsis. Each of the ten verses of the Magnificat contains a mystery. I thought, asked the Lord, what shall I do? Should I give two conferences, one on the Visitation and another on the Magnificat? Should I try to combine them? As you see I decided to combine them. Each one of these ten verses contains enough Truth for ten years of meditation. But since the retreat is on the Rosary, some of us will have ten more years. I’m beginning with the speaker, some of us may not have ten more years to meditate on theMagnificat which in Divine Wisdom as we’ve been doing, we’ll count. Recognize the Greatness of GodFirst, My soul magnifies the Lord. And that, by the way, is the literal translation of both the Greek and the Church’s official Latin. Why, indeed, this hymn is called the Magnificat. Hold on to your Catholic vocabulary. I’m not even sure, I really am not. I didn’t check it whether Webster’s Third International Unabridged has Magnificat as one of the words that are defined or magnify. Well maybe if they have the word magnify, you know, you know for people whose sight is weak, use a piece of glass to magnify. O how we have cheapened the Treasury of Divine Wisdom. Magnificare, of course means to make magnum, make big. Meaning what? Is it possible to magnify something which is objectively small? Yes. But in the Church’s vocabulary, when Mary said,“My soul magnifies the Lord” what she meant was, my soul recognizes the greatness of the Lord. There is none greater than God. What a cheap almost blasphemous comparison. No one greater than the Lord. This is God! Talk about greatness - except for Him, there wouldn’t be anyone else! That’s pretty great! To magnify, therefore, means to recognize the greatness of God. But in order to magnify as Mary did, our minds must first recognize who God is. For fourteen years, I was teaching in the Graduate School in St. John’s University. By the way, the largest Catholic University in the United States: regular enrollment now over seventeen thousand students. But I was told by the Holy See to go to New York, team up with a convert from Judaism to start a Graduate Department in a Catholic University. What’s the name of the department? The Department of Catholic Doctrine. That there would be at least one, and we were not a big department, that would concentrate on Theology. On God. As I walked to my classroom at the University, I would have to go past the large, mammoth Law School. To Magnify the Lord means, first, that my mind knows Who God is! Any comparison I make, I’m sure we’d be safe. Most people know a hundred times more about creatures and the things of this world especially that one delightful, oh, beautiful creature that has our name. A hundred times more, a thousand times more than people know about God. But then, if magnifying the Lord begins in the mind, recognizing His greatness, it is expressed first by the will, in loving this Great God and then in telling others about Who God really is. To magnify the Lord means to praise the Lord. To magnify the Lord means to honor the Lord. To magnify the Lord means to obey the Lord. To magnify the Lord means to admire the Lord. Find Joy in GodMary continues: “My spirit rejoices in God my Savior”. Just as most people, most of the time magnify everybody else, praise everybody else and are just looking around to have somebody praise me and then life becomes worth living because somebody has complimented us. So, even as people spontaneously praise, admire and the word magnify everyone else, beginning with themselves before it even dawns on them to magnify or praise God. So people will find joy. You name it. What we weak human creatures can find enjoyment in make the angels, symbolically speaking, shake their heads and if they could shed tears. What should be, we’re making a retreat, we’re meditating on the Magnificat and we’re reflecting on Our Lady as our model. And my spirit rejoices in God my Savior! She does not say; and my spirit rejoices in myself or my spirit rejoices in you, dear Elizabeth. Now, God does not forbid us to find satisfaction in creatures, but every satisfaction we experience in creatures must be - if we’re going to be truly followers of Mary - must be founded on the joy we find in God. Every satisfaction, every happiness, every pleasure that creatures give usmust, I repeat, must be only a means to an end. What’s the end? To find joy in God. No creature satisfaction dare be an end in itself. We are therefore, mainly, to rejoice in God. For the gifts He has given us! Joy That Our Sins Have Been ForgivenMary (strange language) she said, “My spirit rejoices in God my Savior.” I thought Mary was conceived without sin. Did Mary have to be redeemed? Yes! The language the Church uses – she was pre-redeemed, pre-saved. We are needless to say, are post-redeemed or post-saved. Meaning what? Christ first had to be born of Mary and then die on the Cross for us to be redeemed. But Mary had no difficulty in saying, My spirit rejoices in God my Savior. What perfect synonym could Mary have used? She could have said, My spirit rejoices in God my Jesus: That’s what Savior means. In my years in the priesthood I’ve dealt with, I want to say, more than my share of sinners especially if you go out in search of them. When you call a sinner up, on occasion I’ve had them hang up. So what do I do? I call back. Can I come over? What for? Look, what for, I just want to, to meet you. I hear you are a nice person. I use what we call a broad mental reservation. The joy that comes from the realization that our sins have been forgiven. We go on. Mary’s Joy Came from Her Profound HumilityThis is Mary speaking. “Because He has regarded the lowliness of His Handmaid, for behold henceforth all generations will call me blessed”. Mary’s joy was over God’s goodness to her. Recognized, watch it, that she was nothing in her own eyes. Mary’s humility was not a blind humility. She realized the graces that she had been given by God. In other words, Mary’s joy first came from her profound humility in recognizing how blessed and generous God was to her. Can we rejoice over the graces God gives us? Sure! Ah! But the secret is, we never give ourselves credit. Am I clear? I could exhaust my own vocabulary, talk for the next century and I could not begin to exhaust the importance of a humility that sees itself as nothing, and that praises God for everything that we have and possess. Moreover, Mary foresaw how all future generations would praise her because she was blessed by God. We’re going to touch on this and this, as you see, will be one of the longer meditations. The secret is not to be blind either to the natural talents that God gave us or to the supernatural graces He confers. But then, if we want God to use us and He will, we must remain absolutely humble. As I know you’ve heard before, humilis, in Latin comes from the noun humus which is dirt! Nothing! And let me tell you, if we are genuinely humble, God will people walk over us and I mean what I’m saying, treat us as dirt. Look, I’m as human as you are. I want to be respected and accepted and loved as much as you do. But if I’m truly humble and I expect God to use me as He surely used Mary as a channel of His grace, the key is to be - and I use the adjective - dirt humble. We go on. Humility Is Not Blind“Because He Who is Mighty has done great things for me and Holy is His Name”. We repeat, humility is not blind. Let me tell you, the secret of genuine humility is not in not realizing who I am or what I’ve got. The secret of Humility is not giving myself credit for whatever I’ve got. Am I clear? That’s the key. In the last several months in the fall season, I’ve been giving lectures in different cities and people want to sell some of the books that this sinner has published. So depending on how many bought books, I didn’t sell any of my books, other people did but I was asked to, I wasn’t sure quite what to do. I figure you don’t endorse a book, you don’t sign a book, you autograph. I say this and I trust the Lord is helping me say the right thing. I’ve got to keep telling myself as I autograph these books, “Hardon, you’re a fool, you’re an idiot! Except for God’s mercy you should be in hell!” You know what I’m trying to get across? We recognize what God has given us. But we make sure that, with Mary, we identify the source of whatever we have. And we never act as though whatever we possess is our own. Never! Never! Holiness Is Selfless CharityIt was for this reason that Almighty God had done such great things for her that Mary said that God is Holy. Over the centuries the Church has come up with many definitions of holiness. Here is Mary’s definition of holiness: God is Holy because He is totally unlike anyone and anything else. But how is God so totally different from everyone and everything else? Because of His utterly, selfless Goodness. Even we, no matter how generous we may be to others, do we actually benefit by our love of others? Do we? Yes! Does God benefit from His Love for us? No! Holiness is selflessness. Holiness is selfless charity, Mary’s definition of Holiness in God. Oh! How much work we all have to do and those of us who are older almost wish we could start all over again. Selfless Charity is both the source and the definition of holiness. We go on. We Are to Fear GodFor generation upon generation is His Mercy to those who fear Him – Divine Mercy – that is what Mary is talking about. He is, especially His Love for sinners and, in Mary’s language, the condition for obtaining mercy is to fear the Lord. How this needs saying nowadays. When, I don’t have to guess I know, in one textbook or series of textbooks in religion, nominally Catholic religion, after another and have a hard time finding even mention of sin or fearing God. Everything is love. Love this and love that. I’ve had people call me and have people write to me, Father, I’ve just buried – whoever they just buried – a near relative. A priest gave a short homily at the funeral. Not one word of praying for the soul of the departed! We are to fear God! And Mary tells us, we’ll obtain mercy from God in the degree to which we fear God. When you think of all the things that we fear, let’s make sure and let’s examine our consciences, is a laudable fear of God one of the strong motives in my life? Now immediately we distinguish between what the Church calls filial fear (fearing to offend a loving God) and servile fear (fearing to be punished by God). But then this servile fear can be holy. If the fear is authentic. I don’t fear God just because I’m afraid of being punished. All true Fear of God is founded on the Love of God Whom I fear to offend. We continue. The Root of All Sin Is Pride“He has shown might with His arm, He has scattered the proud in the conceit of their heart”. Let’s see what Mary is telling us. God’s Omnipotence is not only in creation and bringing the world out of nothing into being. God’s Omnipotence is also constantly shown in His justice toward sinners. The root of all sin is pride. The root of all pride is in the heart. And the root of all pride in the heart is self-conceit. What are we being told? If we want to please God and reach the Heaven for which we were made, we must be more conscious than any of us are (beginning with the speaker) the constant, spontaneous tendency of each one of us is and I’ve got a series of words beginning with self. Self-satisfaction, gosh I did well! Self-admiration and the most dangerous temptation to self-admiration are not mirrors made of glass with silver so we can see our faces. Self-admiration in the mirror of our own minds, not admiring from one side, from another side, ah! Self-preoccupation. I believe every language has the expression to describe a kind or generous person. We say that he or she is thoughtful. What do you mean, thoughtful? Thoughtful of others because we assume that everyone is constantly thoughtful of himself. Pre-occupied with self. Self-indulgence. Self-seeking. Self-interest. Self-conversation. We even have a word for it, monologue or soliloquy. The hardest and most important examination of our conscience is examination of our hearts, in their constant, spontaneous, pre-occupation with ourselves. Only Humble People Are Channels of God’s GraceSeventh. “He has put down the mighty from their thrones and has exalted the humble.”This is the first of two comparisons that Mary makes between God’s dealings – His dealings with the proud and His dealings with the humble. He humiliates the proud in this life to bring them back to Himself. Anytime you hear or read about a sinner being in trouble, thank God! Recite theMagnificat. Because maybe, just maybe, the sinner will come back to his senses. But then, if the sinner does not come back to his senses in this life, then God humiliates the proud in the life to come - punishment in Purgatory and even in Hell. And we should all legitimately ambition not having to go to Purgatory. How can you avoid it? By working, slaving, digging, exhausting yourself and removing pride from your hearts. But then, Mary says, He exalts the humble. How does God exalt the humble? In this life, He uses the humble to achieve His purposes. Only humble people are channels of God’s grace. We shall be used by God to bring grace to others in the measure of our humility. In the life to come, that’s what Heaven is all about. Heaven is the home for the humble. Pride is in hell. Only humility reaches Heaven. The Whole Human Race Is HungryEighth. “He has filled the hungry with good things, and the rich He has sent away empty”. There is a profound sense in which we can say that the whole human race is hungry, hungry for love, hungry for acceptance, hungry for being thought well of, hungry for being spoken to. The hungry will be filled with good things provided they are humble and look finally to God to satisfy their hunger. Let me tell you, if you expect human beings to satisfy you in this life, you’re following a mirage. They won’t. They just don’t. God fills those who humbly seek to be filled by Him with Faith, with Grace, with Peace and with True Interior Happiness. The rich, Mary says, He sends away empty. This does of course include the materially wealthy. They must share their wealth. Otherwise, as I’ve told enough of them, you’re going to go to hell. That, by the way, is Mother Teresa’s philosophy. She doesn’t quite use that language but she tells rich people - if you want to save your souls, share what you’ve got! But the rich people are also - in Mary’s vocabulary - those who are rich in their own eyes, who think they’ve got, they‘ve got it made and lack the humility of recognizing that whatever they have is from God. They’re going to be deprived, first, of true happiness in this life and then of Heaven in the life to come, unless, they become humble before their body dies. God Is Merciful to His Chosen PeopleNinth. “He has given help to his servant Israel mindful of His Mercy”. This Israel - of which Mary is speaking - was, first of all, the chosen people. They were so often unfaithful as we read in the Old Testament. When the Messiah came, they rejected Him. Yet, God chose to become Man from among the chosen people. Mary was a Jewish woman. God’s plan, as we know, was to use the Jews to evangelize the rest of the world. They rejected Him so He did not use them. But this Israel is also the new Israel, we belonging to Christianity. God is constantly providing His grace. Specially, we are the spoiled children of God. And the foundation of our being the really chosen people is our Faith in His becoming Man, provided we believe clearly and strongly our sins are removed. Naturally we are afraid and the closer we approach eternity, the more frightened we become, naturally. But this where supernatural grace should overcome our nature, keep reminding ourselves in Mary’s words, that God is Merciful to His chosen people. We are in His Friendship. We will be saved. We Are to Generate OffspringLast and tenth statement of Mary. “Even as He spoke to our fathers, to Abraham and his posterity forever”. There are two kinds of posterity because as we know there are two kinds of generation – physical posterity in regenerating oneself in body and a spiritual posterity, in regenerating ourselves in soul. I’m talking to the right audience. Let’s make sure we believe and are convinced; we are to generate offspring. Indeed, it’s a command! We are to reproduce ourselves, some and the majority of the human race physically, but everyone, beginning with Mary, surely every priest and every religious. That is why - do you hear it - that is why we take a vow of chastity or celibacy that we might be, and this is the Church’s language, more fruitful even as Mary was and remains the Queen of Apostles, having reproduced herself by now in countless millions of souls, so we, like her, providing we follow her example of deep humility and selfless charity - we too, will have our posterity going back to our father Abraham, our father in Faith. Amen. In the name of the Father and of the Son and of the Holy Spirit. Amen.